The summer of 1910 was pretty dull apparently, nothing like the weather in London this year, or indeed the heat wave of 1906. So there was no reason why thousands of Londoners shouldn’t head towards the Great White City to see a new exhibition. 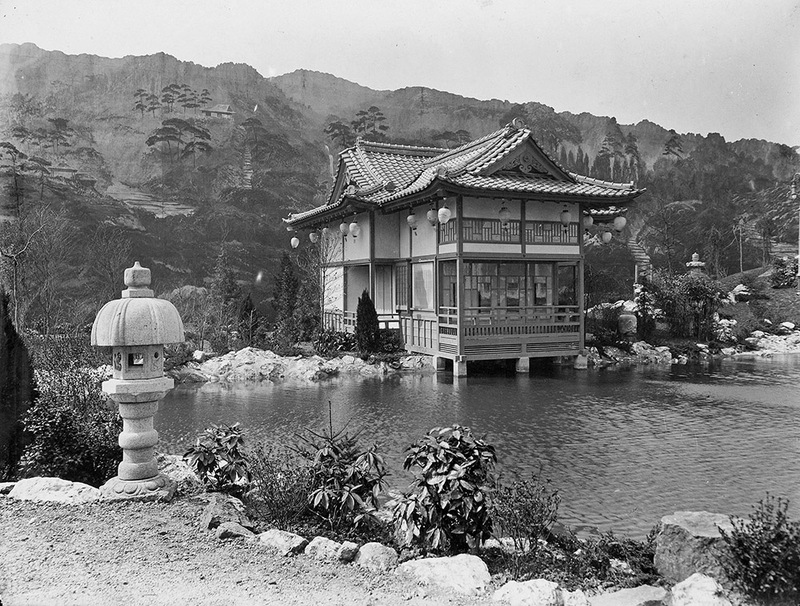 This week we’re joining them, crossing the Kensington border into Hammersmith as we sometimes do, to see some of the wonders of the far east. Visitors could walk among traditional houses and gardens. 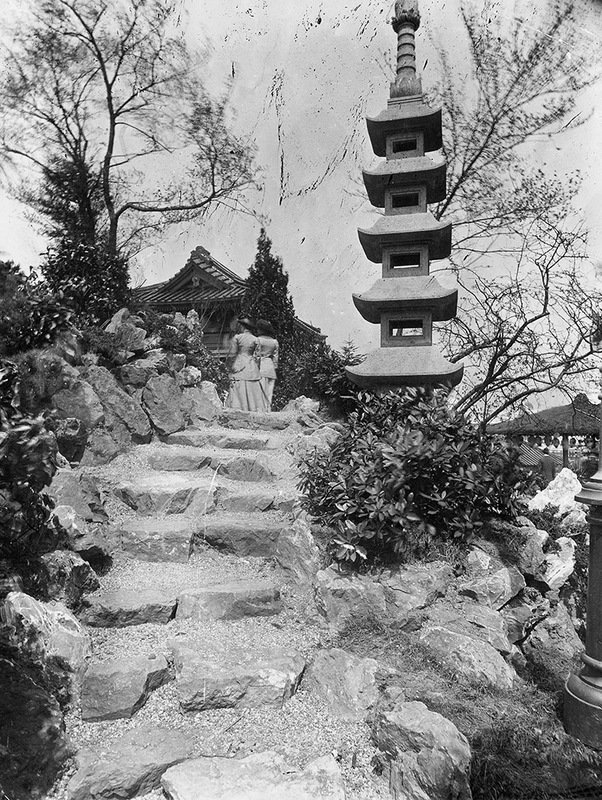 Climb up landscaped paths, as these two women are doing. And enjoy exotic vistas. You can barely spot where the painted backdrop begins in some of these pictures. They hardly seem to be located in the crowded exhibition site with its other rides and attractions. 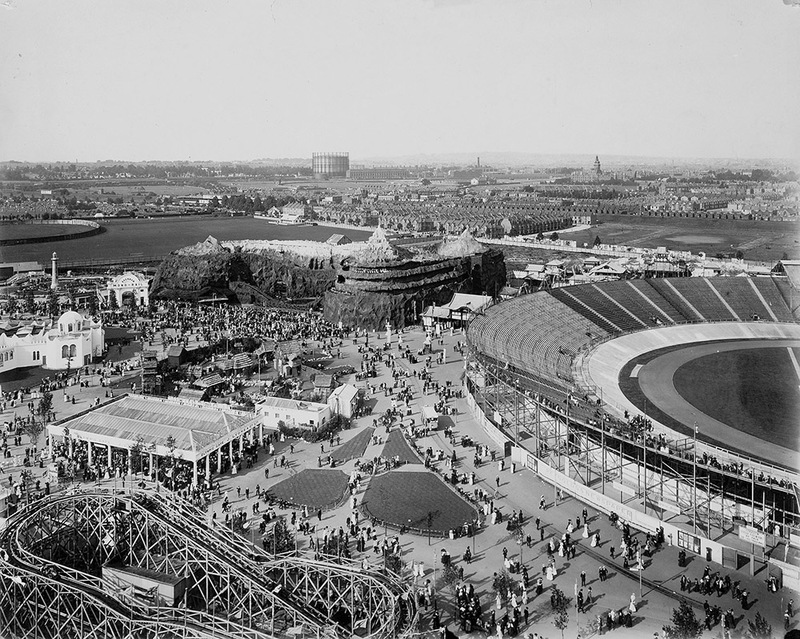 This picture shows the site with the the stadium . Note in the distance a gasometer and the tower of St Charles Hospital in north Kensington. 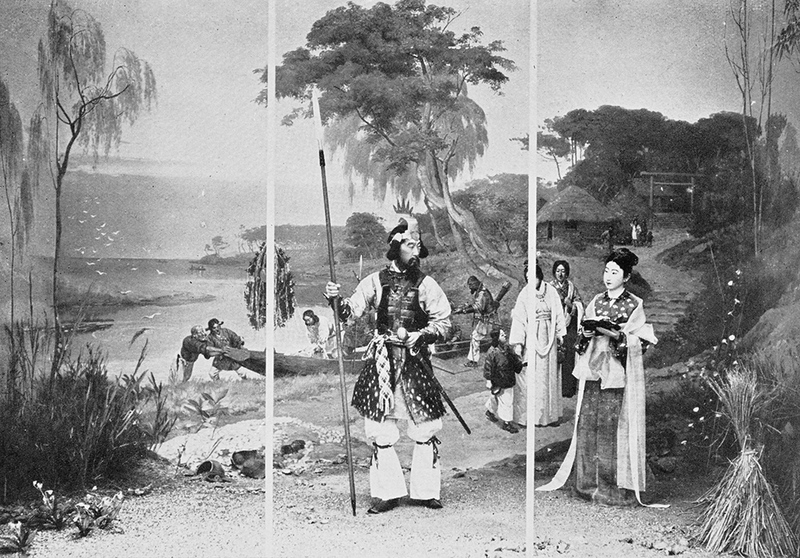 Actual Japanese performers enacted tableaux of traditional scenes. 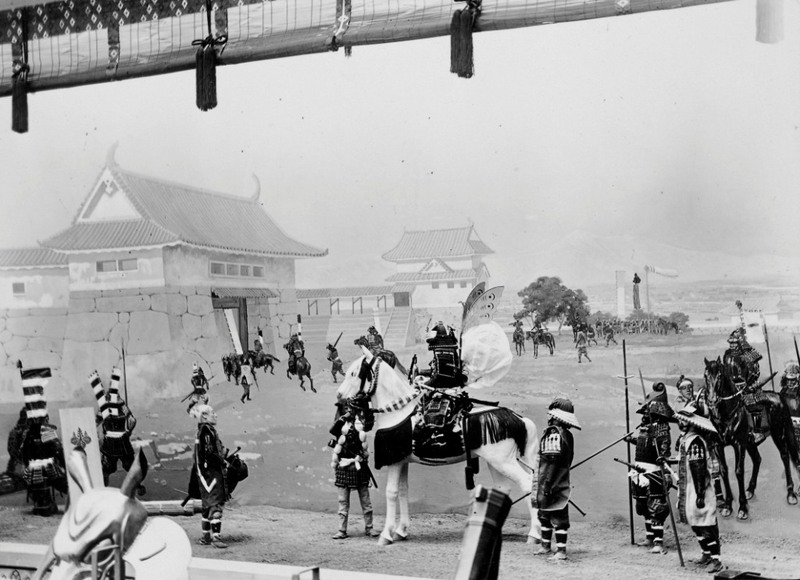 Including warriors, as seen below. 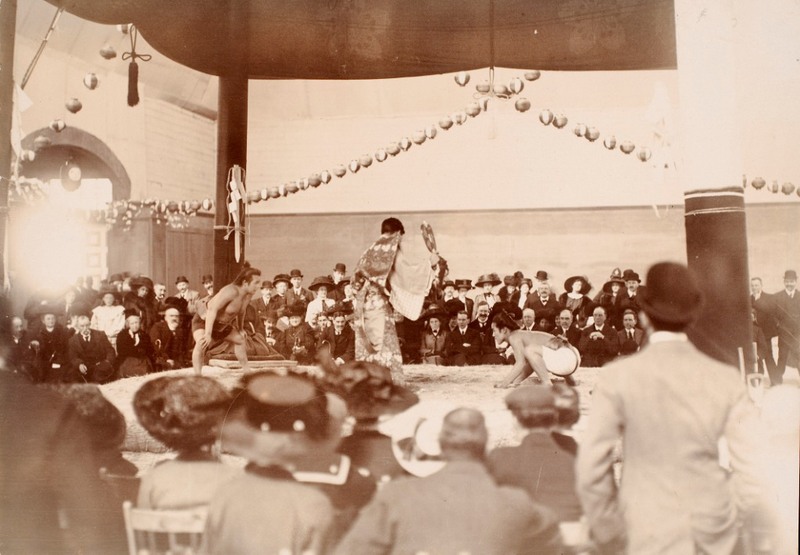 Londoners were already used to re-enactments of battles and historical events in shows like the wild west performances at Earls Court and elsewhere. Sumo wrestling offered something new. And for some there were martial arts skills to learn. 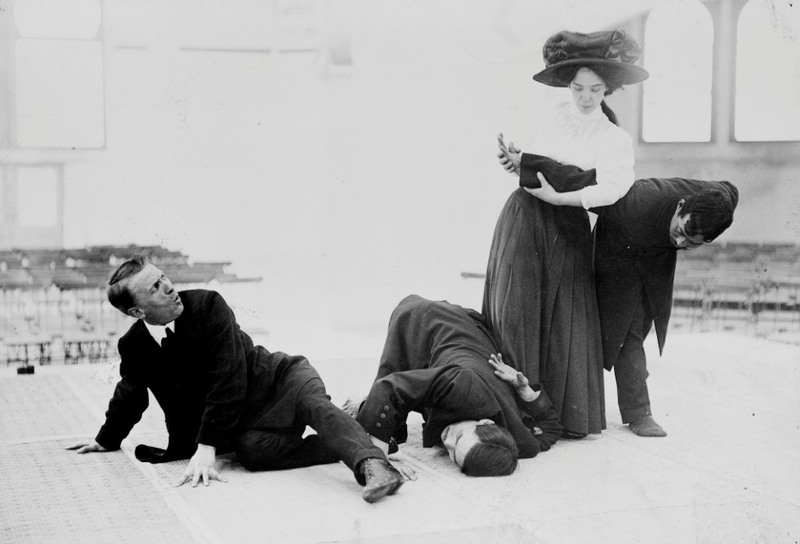 Here a woman demonstrates how to see off some attackers even in modern Edwardian dress. 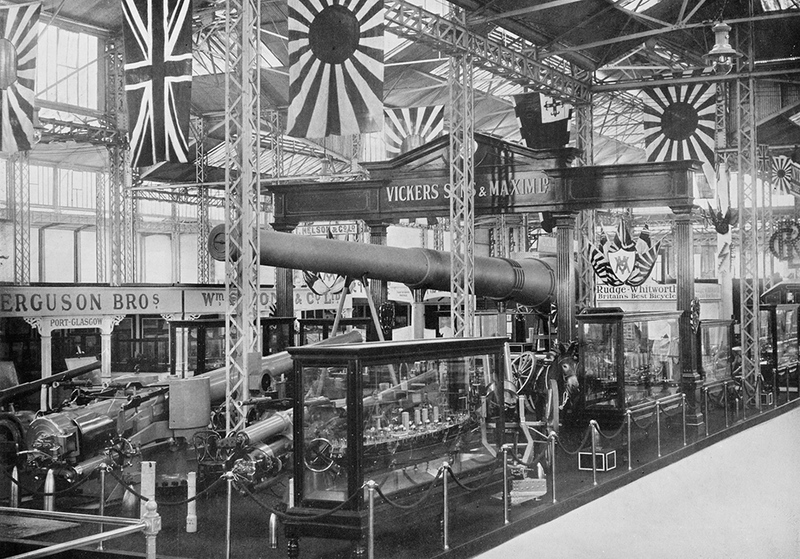 The Japanese government was also showing off the sights of the modern industrial Japan. Which had already embarked on its own military / imperial actions. During the exhibition a Japanese warship was visiting the country to emphasise Japan’s role as an ally of the UK. It was after all, just a pleasant day out. For some visitors it was perhaps almost too much. 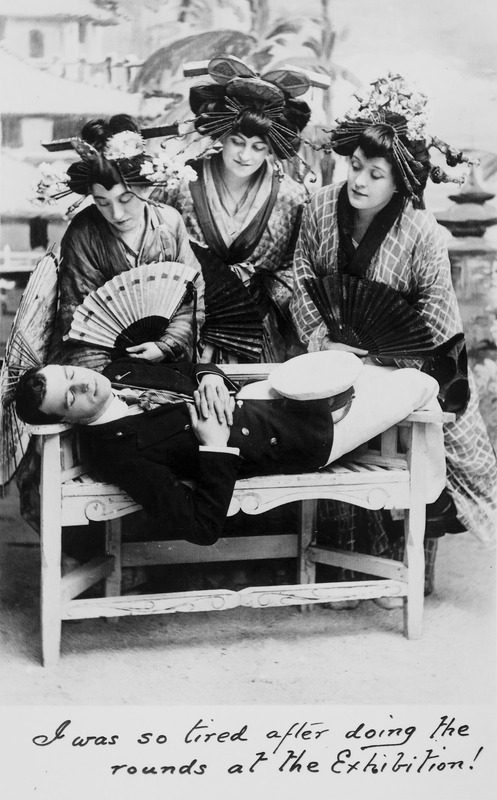 A trio of distinctly European geishas have some pseudo Japanese fun with a tired young man. 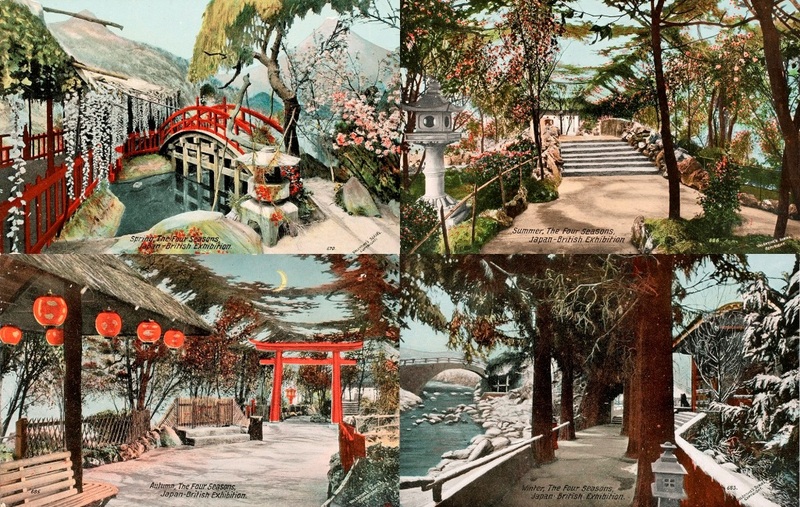 We’re still obsessed with Japanese culture today and you can see it everywhere. 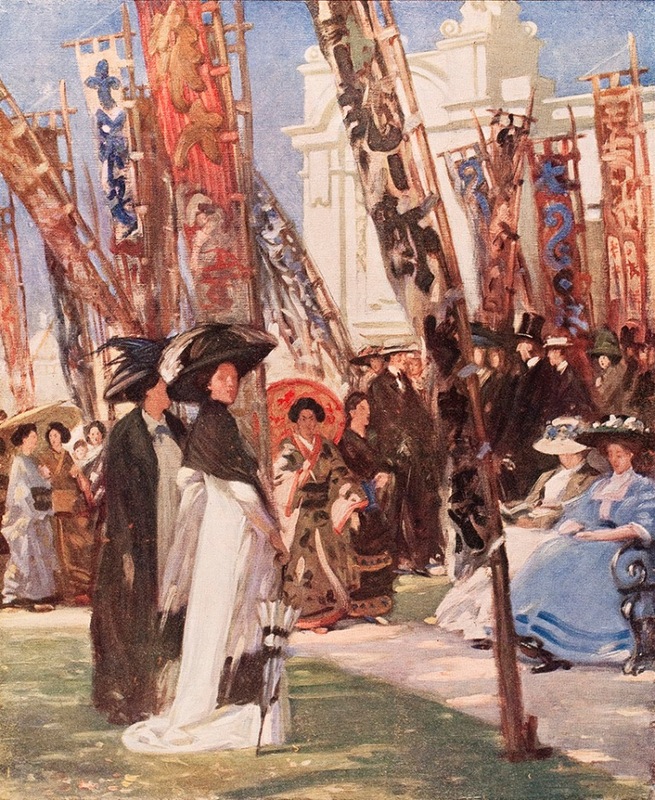 I wonder if our old friend Yoshio Markino made it to the exhibition? This week’s images came from the Local Studies and Archives department of Hammersmith and Fulham, courtesy of their manager and mine Adrian Autton so thanks to him. 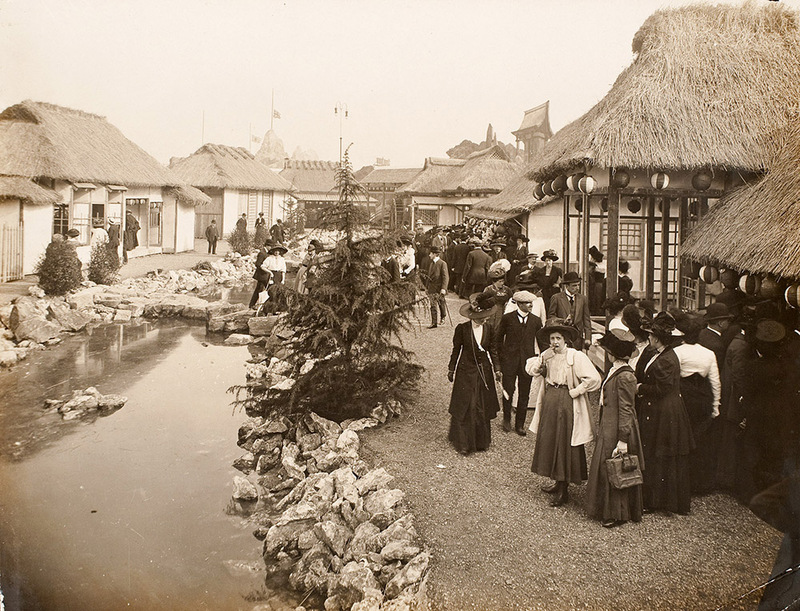 This entry was posted on Thursday, July 20th, 2017 at 7:54 am	and tagged with Japan, Japan-British Exhibition, White City and posted in 20th Century, London. You can follow any responses to this entry through the RSS 2.0 feed. 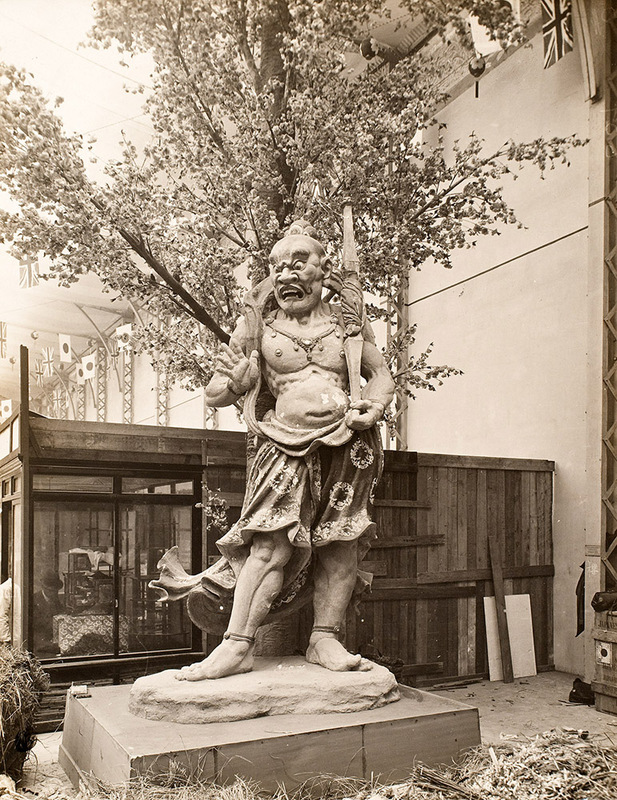 Remains from this exhibition still exist. 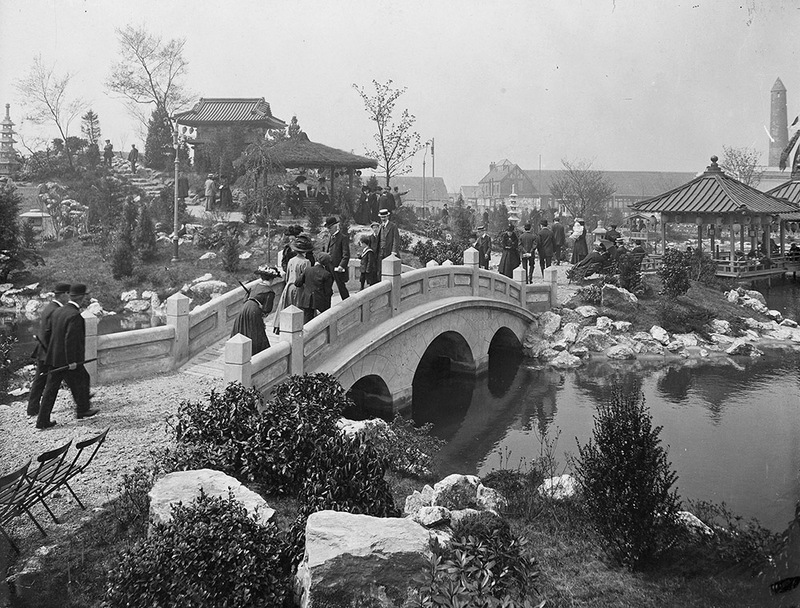 In its’ original location the bridge and a recently re-made Japanese gravel & rocks garden can be viewed within Hammersmith Park situated immediately west of the former BBC Television Centre Wood Lane. 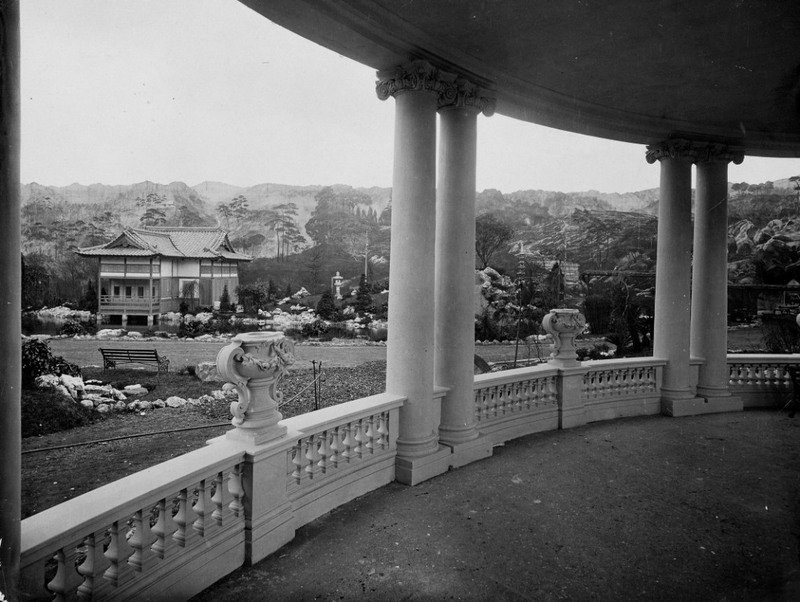 Further west, within Kew Botanical Gardens’ Japanese garden stands a gateway originally erected for this exhibition. The Council and KCTMO, without consulting residents, has decided to take over part of our common land on the Wiltshire Close estate, including allotments and lawns. In its place they are going to build a Street Sweeper’s depot on the estate – completely altering this quiet and possibly historic close. We want to see if we have any grounds to challenge the alteration to the amenities, and are looking in to the history of the estate which i believe was constructed just after the war for veterans. If you can point me in the direction of anything useful I would be most grateful. A beautifully presented and interesting review. Thank you.